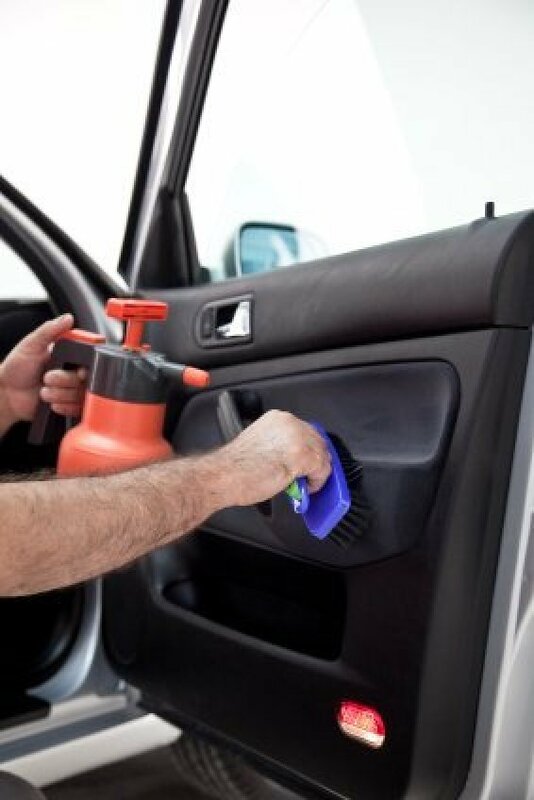 Keeping your car's interior clean is a great way to maintain it's appearance and resale value. This page is about how to clean your car's interior. Mr. Clean Eraser cleans dashboards and doors with ease! Most vehicles have a pocket on the back of the front seats and I keep a package of disposable wipes meant for car upholstery there. Whenever I am in my car and waiting for some reason for a few minutes, kids at school, highway construction or whatever, I grab one and take a wipe at my dash and door. If I don't get it all done, I keep that one in the corner of my windshield until next time I stop for an extended period of time. Or when the kids get in the car, they will us it to wipe the other side and their door. When I get home from shopping, I use one of the wipes. Then my car is clean and ready for my next trip. I have kept a rag sprayed with dusting solution in a ziploc bag in my car at times, but the disposable ones can be purchased pretty cheaply now. Tips for cleaning your car's interior. Post your ideas. To detail the inside of your car yourself after thoroughly cleaning the inside use cotton swabs dipped in rubbing alcohol to give it that finished look around buttons, knobs, and those hard to get little cracks. Use a Q-tip to clean out the grooves and hard to reach places in your car. Remove anything that shouldn't be in the car or is removeable such as mats and driving accessories. Then, before you visit the store and buy some expensive purpose made cleaner brush off all the loose dirt and try soapy water with a few large damp rough cloths for all interior cleaning, including upholstry. If done regularly this is often enough to remove all dirt and grime. When the surfaces are clean you can spot treat any marks/stains. Another great tip is to use a small paint brush!! Use in soapy water, shake out some & dive in where ever needs cleaning!! Also great for crown molding, ceiling fans, shower door tracks, sliding window tracks, the list is unlimited!! you can you a high pressure air hose to blow out in between the seats,door cubbies,center councile, and hard to reach places to vac. I also use mr clean dry erasers to get off any marks on the doors,dash,steering wheel,blinker lever,head light switch, or any marks anywhere in the car... 409 orange degreaser also works good for sticky stuff you cant get off or out of cup holders. I need help getting stains out of my back seat. It had carseats on it for awhile, and the kids didn't tell me that they spilt juice. Would some kind of carpet cleaner work? I'm not sure....HELP ME!! What can I use to clean the dashboard and interior door handles that doesn't dry out everything? Black Magic Pro Shine Protectant. Spray or wipes. But if you use the spray, use a cloth rag, not paper towels...they'll leave fuzzies everywhere. My son-in-law has worked at a dealership for years and he always uses pledge or generic pledge on all his cars and it does a great job. Clean it first with Murphy's Oil soap, or store brand equivalent, in water, with a soft cloth. Allow it to dry, then go over with the furniture polish, spray the polish on the rag, instead of the surface. Armor All. Cleans and keeps interior nice at the same time. Sweet and sour sauce sauce spilt on the back seat in my car and I cannot get rid of the stain and odor. How do I get rid of the stain and the odor in my car? If you live somewhere it is safe to leave your car doors open, then that will help. Smells build up in confined spaces. The vinegar in the sweet and sour sauce is probably lingering, so a wash or several washes with washing-up liquid and hot water should help. There is probably an orange-coloured stain as well, which will be difficult to get rid of. Several goes of hydrogen peroxide or powdered oxygen bleach may remove it without damaging the car seat. If it remains despite all your efforts, just get a rug to cover it. Febreeze is a good choice for this. How do I clean and/or remove the sticky interior of a VW Jetta 2003. It is disgusting in its appearance and feel. Any help would be greatly appreciated! You haven't said what kind of surface you are dealing with. Cloth, leather, vinyl, plastic? It all depends on the material that has been sullied. The surface is a fake leather looking vinyl. It appears like there is a layer of something peeling off and that is what gives the gummy texture. A car dealer said it was something that was applied to 2003 Jetta as a protection but after a while started to get gummy and peel. Unfortunately, he had no suggestions on how to deal with it. How do I remove gum from a truck seat that is cloth? I first tried freezing it with a bag of ice, but it actually came off better when the sun warmed it up. Rubbing my hand back and forth over the gum when it was warm caused it to ball up and roll off. Try rubbing alcohol. I use it on fabrics and it works great. Tips for cleaning the interior of your car. Post your ideas. I use unscented baby wipes to clean the inside of my car, they pick up a lot of grime and last longer than paper towels. I also use baby wipe- I keep them in the glove box and do a little dashboard cleanup while stopped at a stoplight. I find that I don't get so impatient waiting for the light to change and I don't have to put aside extra time for this chore. My dog is very nervous when left alone. She has licked the roof lining in the car above the windshield. The liner is now stained brown and resists cleaning. The stain is resistant to soap and common spray cleaners. Suggestions would be welcome. This is a guide about removing stains on a car headliner. Kids, pets, and routine use of your car and result in accidental stains on the upholstery and headliner.